Everything began in December of 2107. Matthew was just like any other five years old, happy and so full of life. Like every morning, I sent him to school, but this time he came home from the bus crying hysterically complaining of a headache and the smell of the bus. He mentioned it made him nauseous and begged me not to let him go anymore. Like most moms, I reassured him it was going to be okay and tomorrow would be much better and sent him the next day. However, this time was different. Not only did he continue to go on and on about the headaches and the horrible smell of the bus he began to have fevers that lasted all throughout the night. Matthew mentioned his legs hurting, and I began to assume these things going on were growing pains. As the days went on I began to notice his loss of appetite, which was rare especially during the holidays. The following week was Christmas Eve, which we spent with family and friends. Seeing everyone so happy and cheerful I couldn’t help but notice my little boy feeling more down than usual, it was almost like I didn’t know who or what was taking over him. The fevers, nausea, and bone pain had me worried. I scheduled him a doctor’s visit and got in right away. They performed a normal check-up, where then they told me was normal and in range, it was most likely a virus going around. Something deep inside me told me it wasn’t just that, it couldn’t be! I began to reach out to other doctors and they all told me the same thing, this began to make me more and more worried. Not only did I know the little boy standing in front of them, I knew something wasn’t right, but I could also feel it in my heart. I begged the doctor to try one more time, they assured me they were the specialist and I was just the mother and there was nothing more they could do for Matthew. I said, run a blood test. They hesitated but the only voice I could hear was Matthew’s cry and yearn to say mommy help me, please help me my head and bones hurt. They proceeded with the blood test and I was expected to receive a phone call first thing in the morning. Only this time, I didn’t even make it to my driveway to the news that I need to take Matthew to the emergency room immediately. There, they continued to run tests. 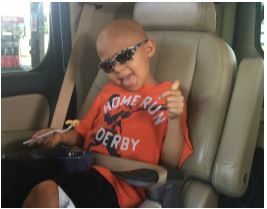 Shortly after, they told me Matthew has acute lymphoblastic leukemia- a childhood cancer. It was in that very moment that my whole life fell to the ground. From that day forward, Matthew was hospitalized for days, weeks, and even months a time undergoing various treatments and studies. I knew God was by my side. I quit my job to be able to meet Matthew’s needs to the best of my ability while his dad worked two jobs full time. We had other children at home. Matthew is the youngest of five, two in college, a senior in high school, and last but not least my little nine-year-old girl. It was our family’s faith and strength that got us through those days. There just isn’t any words that could possibly explain what day after day felt and looked like for us, much less what Matthew underwent. But what I can say, and will proudly do so for the rest of my life is that Matthew is now cancer free. 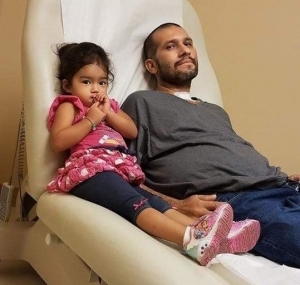 He is still undergoing various treatments at home and has limited the doctor visit twice a month for the next two and a half years. Despite that, it’s those individuals for whom I am thankful for- the doctors, nurses, and specialist that left an impact not only on me but Matthews’ heart as well. The little boy that stands in front of me today is a train loving, silly, outgoing, sweet soul with God’s grace shining right through him. I am blessed to have my healthy little boy back and I will always have a special place for the families that have gone through any hardship and I will continue to pray for healing. Matthew is now 6 years old and in first grade. Although he may not admit it, he will always share a special place for all his wonderful nurses and individuals who have left such a big impact on such a little heart. We may still have a long road of recovery ahead, but with God’s grace and my family by my side, what seems like the impossible suddenly becomes possible. Thank you for joining us on Matthew’s journey. The Blank Children’s Cancer and Blood Disorders Center, Iowa’s first children’s cancer center, opened at Blank Children’s Hospital in 1987 – concentrating all phases of pediatric cancer diagnosis and treatment in one unique area. Today, Blank Children’s Hospital is one of only two hospitals in Iowa treating children, adolescents, and young adults with cancer. 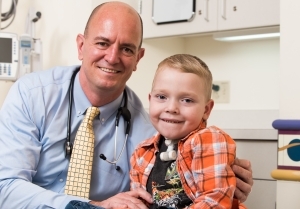 Designed to accommodate the needs of both children and young adults, the Blank Children’s Cancer and Blood Disorders Center provides comprehensive and coordinated medical care by an interdisciplinary team of pediatric specialists. Blank Children’s Cancer and Blood Disorders Center has received NCQA Recognition as a Patient-Centered Specialty Practice (PCSP). Blank Children’s Cancer and Blood Disorder Center was the first pediatric cancer center to receive this impressive recognition. Practices that become recognized under Patient-Centered Specialty Practice Recognition have demonstrated a commitment to patient-centered care and clinical quality through streamlined referral processes and care coordination with referring clinicians, timely patient, and caregiver-focused care management and continuous clinical quality improvement. Holiday Streaker’s donation will benefit the Cancer and Blood Disorders Center. The most common cancer diagnosis is Acute Lymphoblastic Leukemia (ALL). Specifically, the Holiday Streakers will support the Blank Children’s Cancer and Blood Disorder Center Compassion Fund. The Blank Children’s Cancer and Blood Disorder Center Compassion Fund is designed to provide additional support to patients and families beyond what the Cancer and Blood Disorder Center is able to provide. Assistance is based on financial need and is designed to assist with the unique, medical needs of patients and families. This program is supported by 100% philanthropy and would not be possible without the generous contributions of individuals and groups such as the Holiday Streakers. 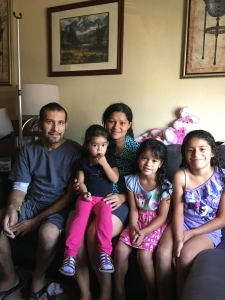 The fund as supported items such as transportation costs and gas cards, meal tickets, travel expenses, prescription costs, equipment needs, and even paying for electricity, water, or rent to help the family. Hundreds of families have been impacted by the Compassion Fund. Here are a few examples of how the fund has helped our patients and their families. – Provided ongoing gas cards for a patient’s family who was traveling 3 days a week from two hours away for treatment. – Helped purchase a shower chair, so the family could provide a safe shower for their child when they were weak from treatments. – Provided three nights of lodging for the family of a patient as the child was getting additional treatment in Minneapolis. Thank you Holiday Streakers for choosing to support Blank Children’s Hospital! Our family never expected to hear the words “Cancer” when we got the results for Camila’s MRI of her knee. At the end of February 2017, Camila turned 15 and had started complaining about her knee hurting. She said it popped while stretching in PE class. At the time we were not too concerned but sought treatment nonetheless. We went to Urgent care initially and got x-rays. The x-rays were inconclusive and did not reveal anything concerning. The weeks passed and the pain persisted, so we decided to have Camila’s primary care pediatrician follow the issue. She told us Camila needed an MRI. It took a few days to get the MRI approved with insurance. By this time it was early in April of 2017. We went in for the MRI one evening. While Camila was getting the MRI, the tech came out and spoke to us about getting a few extra pictures for the doctor. At this time, I became a little suspicious. By the next morning, the orthopedic surgeon called me and told us we needed to go to Iowa City tomorrow. would go in and replace her knee in Iowa City in July of 2017. Then more chemo after the surgery. Everything went as planned; Victor was born in July, Camila’s knee replacement went great, and she was back receiving chemo before we knew it. She finished chemo around Christmas. Unfortunately, we did not have much time to celebrate. In April of 2018, we received news that cancer had shown back up in her lungs. This meant back to Iowa City to remove the metastasis in her lung. 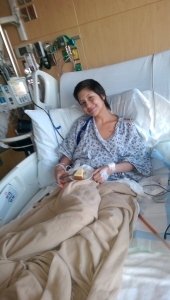 In July, another metastasis showed up between her lung and heart. They were not able to remove all of it, and it’s growing back at an alarming rate. It’s inoperable at this point, so we are trying a new chemotherapy drug to try and get a response. We are blessed to have insurance, but deductibles still have to be met. The deductible went from $5000 in 2017 to $6000 in 2018 – plus countless trips to Iowa City with extended hotel stays. Thank you for your consideration! God bless you all! Founded in 1897, Children’s Mercy is one of the nation’s top pediatric medical centers. 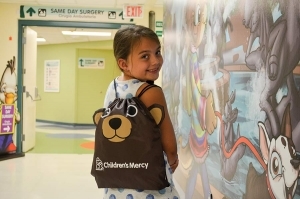 With not-for-profit hospitals in Missouri and Kansas and numerous specialty clinics in both states, Children’s Mercy provides the highest level of care for children from birth through the age of 21. U.S. News & World Report has repeatedly ranked Children’s Mercy as one of “America’s Best Children’s Hospitals.” For the fourth time in a row, Children’s Mercy has achieved Magnet nursing designation, awarded to fewer than seven percent of all hospitals nationally, for excellence in quality care. Its faculty of more than 700 pediatric subspecialists and researchers across more than 40 subspecialties are actively involved in clinical care, pediatric research, and educating the next generation of pediatric subspecialists. Thanks to generous philanthropic and volunteer support, Children’s Mercy provides medical care to every child who passes through its doors, regardless of a family’s ability to pay. 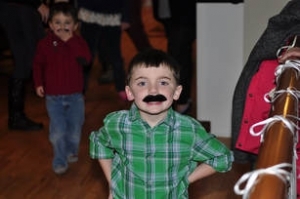 For more information about Children’s Mercy and its research, visit childrensmercy.org. For breaking news and videos, follow us on Twitter, YouTube, and Facebook. Giving to the I Love Children’s Mercy Fund can make a real difference…transforming the lives of thousands of children facing urgent needs, devastating disease and chronic illnesses. Quite simply, your generosity if the heart of our work to heal sick and injured children. I am thankful for the chance to share my story, and also for the amazing things I have heard about Holiday Streakers! My diagnosis with breast cancer came in May 2018. My world with my two kids and I was literally turned upside down. I went on to have my bilateral mastectomy in June, and started high dose chemotherapy shortly after that. In November I will begin five weeks of radiation therapy, and follow that with another six months of IV treatments. I’ve been a nurse for 24 years, and was a pediatric oncology nurse at St. Jude Children’s Research Hospital for the first half of my nursing career. I thought that I knew a lot about cancer and about how it affects families… but I found out quickly that nothing can prepare you for the physical and emotional challenges. Nothing prepares you for having those conversations with your kids and the rest of your family. All of a sudden I was the patient. I was the one undergoing major surgery. I was the one who needed help to get through my days. The great part about my story is the countless ways that my kids and I have been blessed. The people in our lives who show up for us throughout this roller coaster ride is amazing to me. We pray for strength to get through the tough days, and are grateful for ALL the good days. We thank everyone from the bottom of our hearts for all the love & support. Our family is one full of love, faith, and fun. Jim and I have been blessed with four wonderful children. In mid-October, 2016 we put everyone to bed in our typical fashion and in the early morning hours of Joey (5 ½ years old at the time) came into our bedroom to snuggle. Around 7 that morning, all of the sudden our bed started to shake. I thought Joey was being silly and I was preparing to tease him about making such a commotion. However, when Jim and I looked up, we quickly realized Joey was having a seizure. It was terrifying. As a professional in the world of special education, I have unfortunately seen children suffer seizures before – however, NOTHING prepares you to see your own child in this condition. We had put a seemingly perfectly healthy child to bed on Friday night and were waking up to a nightmare. We called 911 and were immediately transported to the hospital. The next few hours were a total blur, with Joey remaining in a post-seizure state for about 90 minutes, through blood draws and other various tests. When he eventually “woke up,” hearing his sweet little voice was an absolutely precious gift. All of the immediate test results came back “normal”, and we were told children sometimes have seizures for no known cause. We left hopeful this was the case for Joey. 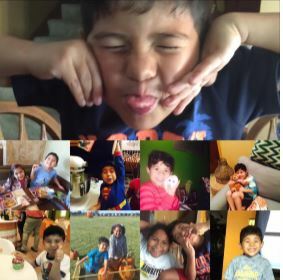 Our hope that Joey’s seizure was a one-time occurrence disappeared, as the next four weeks brought about frequent seizures, ambulance rides, ER trips, EEGs, and a four-day hospitalization at Blank Children’s Hospital. On 11/10/2016, our deepest fears were confirmed: an MRI revealed Joey had a brain tumor. There really isn’t anything to prepare you to see such images or hear these words from a doctor talking about your child. Every piece of our world was thrown into immediate chaos – and yet everything seemed slow and surreal – all at the same time. Thoughts streamed in our minds: This can’t really be happening – What kind of tumor is this? Will Joey survive? What will it take to make sure Joey survives this? How did this happen? Is this really happening? What will we tell our other kids? How will we all survive this? We left the hospital on November 11 and headed home to try to figure out what we were supposed to do next. Joey’s neurologist had referred us to University of Iowa and Mayo. Appointments were made. Hotels were reserved. And, we slowly started sharing the news with our extended family and closest friends. We proceeded to have appointments in Iowa City and in Rochester. More tests, more bloodwork, more images, more of everything – including growing fear, became part of our everyday reality. In addition to the amazing medical teams at University of Iowa and Mayo, we are blessed to have a pretty incredible school nurse in our support squad. 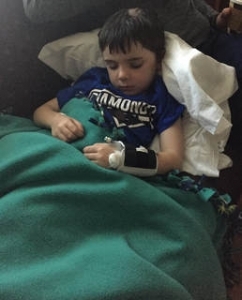 Our school nurse, Keri, shared she had previously been a brain tumor nurse at St. Jude’s Children’s Hospital and made a request to reach out to her former colleagues to see if they would review Joey’s case and give us input. We readily agreed and felt blessed to have medical teams across the country reviewing Joey’s case. The Wednesday before Thanksgiving we received a call from the brain tumor roundtable of doctors at St. Jude’s indicating they were accepting Joey’s case. What a mix of emotions this call brought. 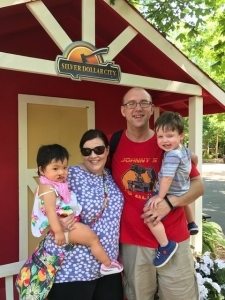 We were thrilled to know Joey would be taken care of by such a world-renowned team and hospital, and yet, this is a place nobody really wants to have to bring their children (other than to visit)! We scheduled flights and prepared to visit Memphis. 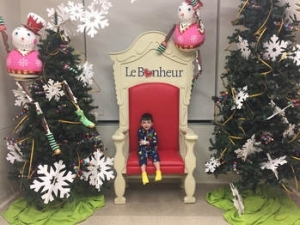 Joey was subjected to many tests, further MRIs and diagnostic imaging, and we were transferred to LaBonheur hospital for surgery. Joey underwent a biopsy to help the medical team determine the type of tumor that had invaded our little guy’s brain. 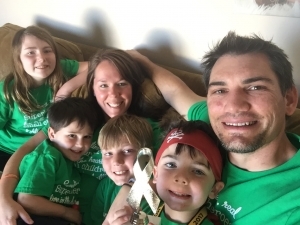 Due to the tumor’s location being so close to the midline of Joey’s brain and near so many converging blood vessels, the surgery needed to be an invasive procedure with the inherent risk involved. Nothing prepares you to kiss your baby, whisper “I love you”, and watch a piece of your heart be wheeled off for brain surgery. The biopsy surgery, thankfully, went very smoothly. Joey, an avid Star Wars fan, woke up in the ICU saying, “The force has awakened!” Joy leaped into our hearts at this! After surgery and Joey’s recovery, we flew back to Iowa to celebrate Christmas with family while we waited for the biopsy results. Finally, the call came. The type of tumor Joey has is incredibly rare (less than 100 cases are currently reported), but thankfully it is slow-growing. Surgery was scheduled for right after Christmas and we tried to have a faith-filled and memory making holiday season together. I found myself taking pictures and videos of EVERYTHING. 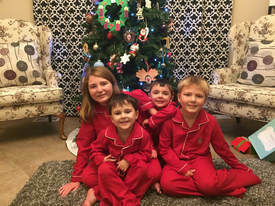 All four children are by the Christmas tree – click. Joey is looking at an ornament – click. The kids have on cute pajamas – click. Photo after photo – because we honestly didn’t know if we would have another Christmas with all four kids again. Would Joey survive this surgery? Would surgery be successful in removing the tumor? Would Joey wake up and know who we were? Would he be able to walk? Even if his body survives – will complications from surgery take the Joey we know from us? Unimaginable questions kept spinning through our heads. Right after Christmas Jim, Joey, and I once again boarded planes headed to Memphis. Another series of tests and surgery preparations ensued. We once again were in the hospital praying, begging, and hoping with all of our beings that surgery would be successful. On 12/29/2016, Joey underwent a six-hour surgery to remove his tumor. Surgery was successful in removing the majority of his tumor. 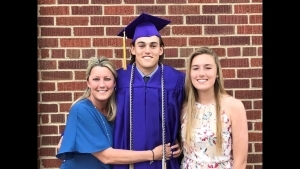 Joey recovered from surgery over the next few days in the ICU – and we know the talent of his medical team, partnered with the prayers of many, helped Joey during surgery and into his recovery. While we don’t know what the future holds, Joey brings joy to our world each and every day. We pray for strength to handle whatever comes our way, and to try to not let the worries and fears of the possibilities overtake our lives. Concerns about tumor growth and future medical needs are daily fears that are impossible to ignore. Fear of uncontrolled seizures is ongoing. 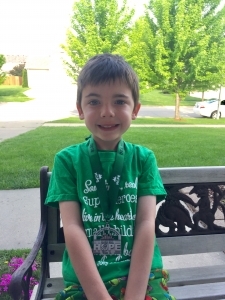 Due to the remaining tumor location – the fear of Joey losing his ability to walk and run, and just be a “regular” kid – is never far away in our minds. Joey’s tumor is on his motor strip, which means it impacts his right leg strength and functioning. 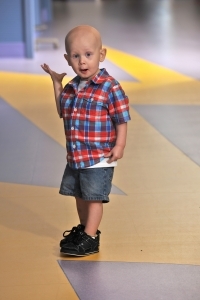 Each time he trips or falls, as little boys tend to do, we wonder…..are those tumor cells causing problems, or is that just Joey being a six year old? Joey takes daily medications and Jim, Joey, and I travel back to St. Jude’s every three months for a series of tests, MRI diagnostic imaging, and blood work. 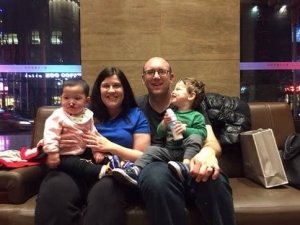 While were are blessed to have a medical “dream team” for Joey, each trip adds to the emotional, physical, and financial burden of this unwelcome journey. Each time we prepare for the trips, our emotions spike to high alert. For the weeks leading up to medical trips, we prepare luggage, we pack medications, we plan distractions to help Joey get through the medical procedures, and we brace ourselves. Preparing Joey for the trips is difficult, as he is fully aware of the procedures that are coming. He hates the needles, fights, and cries during IVs, and doesn’t like “going to sleep” (being sedated) for his MRIs. We prepare our other three children to have mom, dad, and Joey be away from home for a week. I leave work, Joey leaves school, and we take a deep breath. And, we pray, and we hope. “A mom I know posted today that her phone has rung 11 times since her child finished his MRI this morning. Each time, her heart stops, then starts when she sees it is not the call with results. 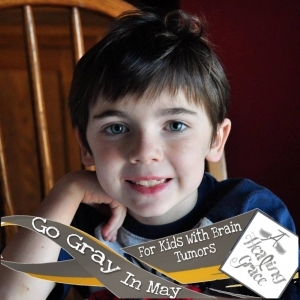 Brain tumor families live through this every three months – praying they get a report of “stable”. We pray and HOPE for the best for Joey’s future and nothing but reports of stable. We feel truly feel humbled and blessed, to have the support and prayers of so many people during this journey. First, I checked out your website to know what the charity is and then to read the history. I think it’s wonderful what you’re doing and also very creative! Thank you for hearing our story! We started our adoption journey three years ago and requested a healthy child only. We didn’t think we could handle any kind of medical needs. A month into the adoption process we found out we were pregnant! We were overjoyed, yet disappointed we had to put the adoption on hold until our baby turned 6 months old (adoption agency policy). My pregnancy was very difficult, scary and short-lived. I was on bed rest for three months and had our son two months early. I got congestive heart failure from the delivery and had to have back surgery from being on bed rest so long. Our son, Sawyer, was born with a birth defect called Sagittal Craniosynostosis that required him to have skull surgery at three months of age and wear a helmet for six months. It was then that we felt like God was asking more from us. We changed our adoption request for a healthy child to special needs. Had we not done that we would never have gotten our sweet Charlotte. She is 22 months old and has a bilateral cleft lip and a complete cleft palate. We brought her home from China six months ago and she had her first surgery on June 21st. Her next surgery is next week, September 27th. Her third will be in January and her fourth a couple years later. The adoption took everything we had, $44,000. We have insurance, which will cover a lot of the surgeries, but the $4,000 deductible this year and next will be hard. Currently, my husband works two jobs – part-time children’s pastor and full-time commercial loan administrator – but next year he’ll go into full-time ministry! This is our family’s dream and desire but it will cut our income in half. This journey has grown us in so many ways and shown us that, although we think we know best, God knows better. We also know we’re stronger than we think and can handle obstacles as long as we go through them together. Thank you for considering us! It’s wonderful what you’re doing to help others. On July 9th, 2017 our lives changed drastically. 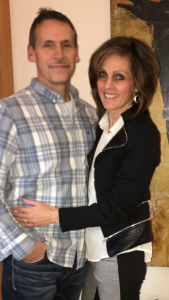 My husband has been fighting for his health over the last several years now but had been feeling better and working consistently for quite a while. 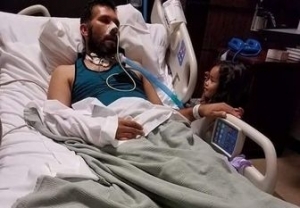 On July 9th it became clear that he needed to go to the hospital. He was in immense pain and could barely even speak. I drove him to the hospital terrified at what might happen next. 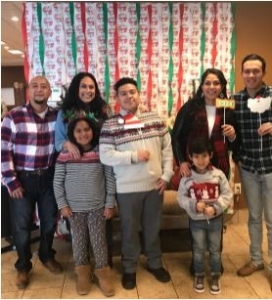 There is no way I could have been prepared for the journey ahead in that moment, but by the grace of God we keep fighting day by day I stayed by my husband, Fausto’s, side all night praying, crying out to God, not knowing why my husband didn’t wake up. He couldn’t open his eyes or speak. The doctors told me the next morning that alongside his diabetes he had been diagnosed with pancreatitis. As I understood, his pancreas was inflamed and no longer doing its job to process the sugar in his body. His diabetes complicated the matter. 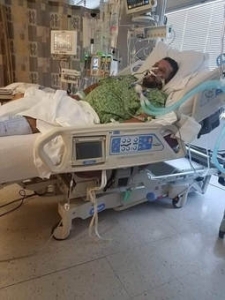 He was also diagnosed with hypertriglyceridemia and the doctors told me they would need to clean his blood through a very involved process over a period of 3 days. I was hopeful that after a week I would have Fausto back at home with me and that with some recovery time he would be able to go back to work. 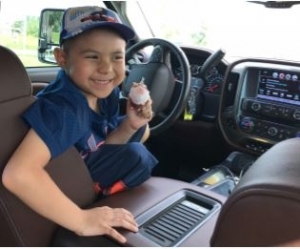 Unfortunately, due to many complications, Fausto remained in the hospital for 6 weeks! I don’t even have words to describe how I felt during that time. Every day was such a desperate fight for life. Every day I would pray and hope that Fausto would make it one day more. I would hold his hand and talk to him not knowing if he could hear me. The tension this situation placed on our family was difficult in so many ways…financial, emotional, spiritual. I previously had been working but with our three girls at home and school starting soon I had to find several jobs to try to make ends meet. Between working early in the morning and late at night I found time to go to the hospital and visit Fausto. Sadly, there were days I didn’t have enough gas money to make it there, so I was unable to visit him. My girls wanted their daddy home and my 2-year-old didn’t understand why she couldn’t visit her daddy (as he was in the SICU). After Fausto was finally able to come home to us after 6 weeks, he had lost almost half of his body weight. He didn’t even look like the same person. There were some complications with his transition home in that he couldn’t keep any food down. Anything he ate, he would throw right back up. Within two weeks of being home, he had a follow-up appointment where we discovered he had lost 9 more pounds in two weeks. They rushed him to the hospital in an ambulance from that appointment and I was again left with my questions, fear, and desperate cries out to God. He was hospitalized for yet another week until he was able enough to come home. Now we are continuing to fight day by day alongside each other. He is getting better. He can walk around and he keeps his food down now. But we know the journey ahead of us is long and some days it is difficult to continue to hope. But I know God has not abandoned us. I have faith that God will heal Fausto. There are so many people that have stepped up to help us in our time of need and I am so thankful. I see the hand of God in the many people who have been there for us. The people who have helped me with rides for my children to school, those who have helped us with food, I have seen the body of Christ at work. Thank you for your generosity and for the support and prayers you are offering on our behalf. We could not do it without you. My mind raced and thoughts crashed into each other as I heard my cancer diagnosis. I thought to myself, how could this be? You see, in November of 2016, I went to my family doctor with a large lump in my armpit. She assured me I was fine. The lump continued to grow and my mind began to wonder even more. What is going on, I thought? Two weeks and an antibiotic later, I went back to my doctor. This time, she set me up at a Des Moines hospital for a 3D mammogram and an ultrasound to examine the lump in my armpit. Nervously, I went to the hospital and had my mammogram and ultrasound. This time, the radiologist read my results. Everything looked “fine” and they sent me home. I was instructed to come back in six weeks if the lump was still there or getting bigger. The lump continued to grow and I returned to my doctor. In January of 2017, I was set up with an appointment to see a surgeon and have a biopsy. I took off work and went to the appointment. When I got there, the surgeon did an ultrasound on the lump. He said he was confident he knew what it was and would be shocked if it was cancer. He told me he could drain the lump now-which would continue to grow back or I could have surgery during spring break or in the summer since I am a teacher. I didn’t want to mess with this lump anymore, so I requested the earliest surgery appointment. On that cold January day, I lay on the gurney with a cozy, warm blanket covering me. I was smiling and laughing with my family as I went into surgery. “I got this”, I said to myself. While in recovery, waiting for my husband and four children, I still thought I was fine and had no idea what was to come. My family’s tearful faces soon joined me and that is when I heard the dreaded C word. You have cancer. Triple negative breast cancer. This cancer is known to be an aggressive breast cancer. I was told I had a cancerous lump in my breast, one in my armpit lymph node and one lymph node between my lungs and fourth rib. The next weeks were a whirlwind of appointments: biopsies, breast MRI, PET scan and surgery to put in a port for chemotherapy. At the end of January, I said goodbye to my 25 kindergarteners and they had no idea I was done teaching that year. Going to work with little children who don’t know how to use Kleenexes or cover a cough was no option with chemo! I began 20 weeks of intense chemotherapy, which I wouldn’t wish on my worst enemy. My ball cap with hair became my best friend. I soon found out the Kiss Shy brand of fake eyelashes were the ones that flattered me the most and I became an expert on painting on fake eyebrows. My chemo nurses said I should be the poster person for chemo. Really? I had 41 symptoms and came out of chemo needing two heart medicines. I guess my symptoms were not as severe as most. Cancer surgery was in the middle of July and lucky me, I had a former kindergarten parent who was a nurse, in the operating room. She too got to see my ta-tas (even though they were double A’s). There went my modesty! I went back to my Kindergarten teaching job at Westwood Elementary this school year. I can feel the love from my coworkers, friends, and family. My breast cancer journey continues as I finish this final phase of 33 days of radiation. I now have a nice sunburn and glow on my chest. I am staying upbeat and positive and every day I continue to say to myself, I GOT this! Thank you, Holiday Streakers, for reaching out to my family and being a part of this journey with me. Our family was blessed to be one of the 2017 recipient families of Holiday Streakers. Our son Joey, was diagnosed with a brain tumor when he was in Kindergarten and only 5 years old. 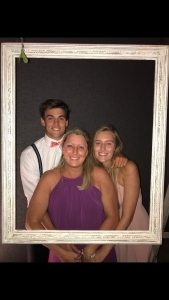 Joey’s diagnosis put tremendous stress on Joey and our whole family – emotionally, physically, spiritually, and financially. Being supported by the daily prayers, positive thoughts – from friends, family, and strangers who quickly became part of Joey’s Journey through Holiday Streakers – was a true blessing. Knowing hundreds of people were sending positive thoughts, energy, and prayer with each footfall of exercise they committed to from Thanksgiving to New Year’s Day was so powerful! During this period of time, we had air and travel and expenses for multiple medical trips for Joey. We also were mentally and physically preparing for additional treatments for Joey in December 2017. We are firm believers in the power of prayer, and having the support of Streaker Nation was felt by our whole family, particularly in December. 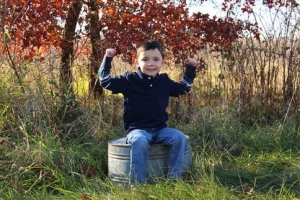 A few days before Christmas, we received the amazing news Joey did not need to have another brain surgery at that time. Sharing that news with our family, friends, and all of Streaker Nation was simply incredible! In addition to the emotional support from Streaker Nation, we were blessed to receive a financial gift. This gift helped us pay off the remaining medical debt we accrued during Joey’s initial diagnosis (amazing!) and has paid for three medical trips for Joey, my husband Jim, and me. We have also elected to donate some of the financial gifts we received from Holiday Streakers to St. Jude Children’s Research Hospital to support children’s cancer research. Streaker Nation is committed to supporting personal and physical wellness, all while supporting families enduring medical difficulty. While I never imagined our family would be on the receiving end of such a group, I can attest to the power of the experience and encourage everyone to join the mission of Holiday Streakers!